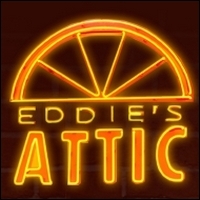 Eddie's Attic is a popular live music venue for aspiring and accomplished performing songwriters alike. A superior sound system, excellent acoustics and outstanding customer service have also made the Attic's music room a hit with music enthusiasts. Parking: Street parking is available in front of the building on N McDonough St. You do not have to feed the meters after 6 p.m. Free parking is also available in the DeKalb County Courthouse deck after 6 p.m. A number of paid lots are also located in the Decatur Square area. MARTA: Take the East-West line to the Decatur station. Exit the station toward Church Street. Walk around to the sidewalk on the right; you'll see a row of restaurants on your left. When you get to the end of the row of restaurants, turn left. The building is ahead on the left.